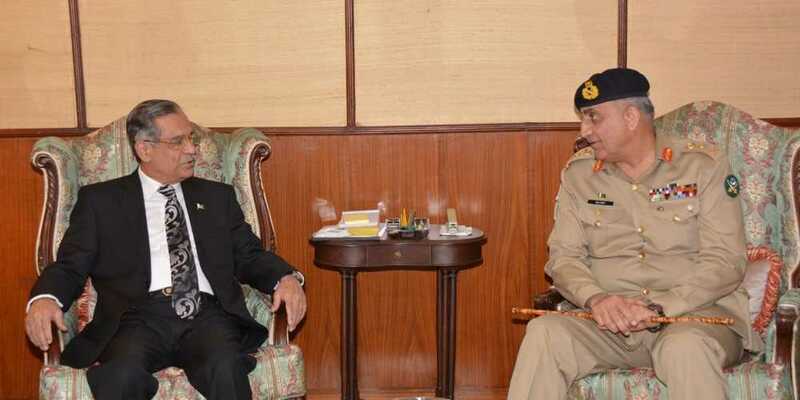 Chief of Army Staff (COAS) General Qamar Javed Bajwa on Monday called on Chief Justice of Pakistan (CJP) Justice Saqib Nisar and presented Rs1 billion cheque to the latter for the dams’ fund. In his letter to the chief justice, the COAS said, "It gives me immense pleasure to share with you that the Supreme Court's decision regarding construction of 'Diamer Bhasha' and 'Mohmand Dam' has been well received by the Pakistan Army." He said that all ranks of the army, including civilian officers, junior commissioned officers and soldiers, had contributed to support the initiative. "Pakistan Army's welfare organizations have also voluntarily made contributions to this cause," the letter read. The meeting between the COAS and CJP was held at the Supreme Court of Pakistan, the Inter-Services Public Relations (ISPR) said in a statement. "Pakistan Army shall continue to contribute towards nation building as a national institution," the ISPR quoted the army chief as saying.